Ten years on since the start of the HPV vaccine programme – what impact is it having? Ten years ago the UK introduced the human papilloma virus (HPV) vaccination into the national routine programme, which is offered to adolescent girls in secondary school. Since then, more than ten million doses of HPV vaccine have been given to young women in this country and we’re now at a place where over 80% of women aged 15-24 have received the vaccine. These results are a testament to the hard work of all our doctors, nurses and health visitors. This means that this generation will be well protected from developing cervical cancer in the future, which is caused by HPVs 99% of the time. So what has all this hard work achieved? 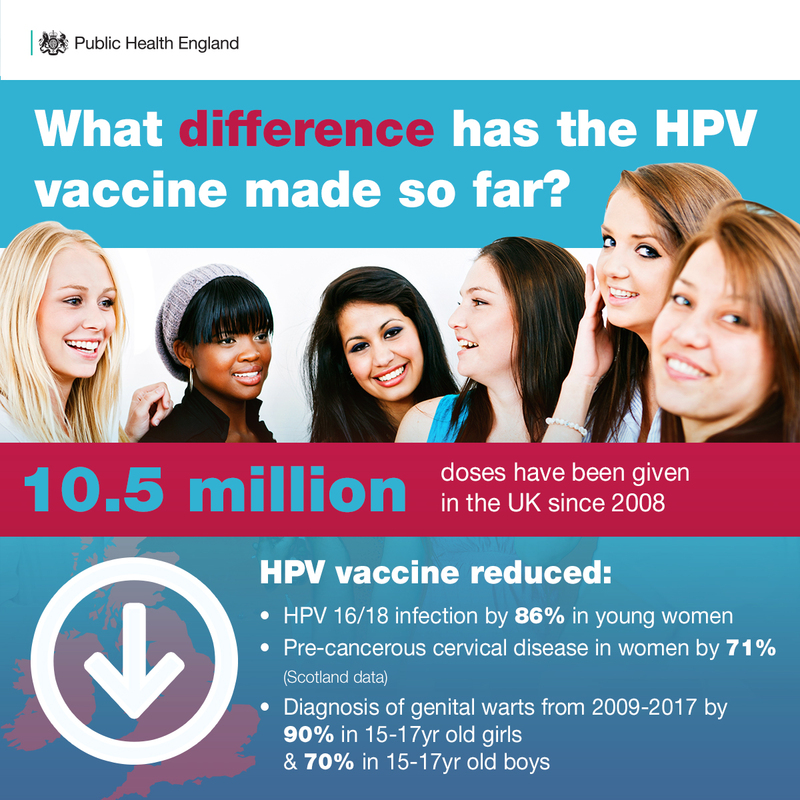 Since the introduction of HPV vaccination, infections of HPV types 16/18 in 16-21 year old women have reduced by 86% in England. Considering around 80% of all cervical cancers are caused by these types, this means we expect to see big reductions in cervical cancer in years to come. Cervical cancer most commonly affects women in their mid to late twenties, so once vaccinated girls reach these ages and beyond we can get an accurate picture of the impact this vaccine will have on this devastating cancer. Although it will take us some years to see the full impact, a Scottish study recently showed that the vaccine has reduced pre-cancerous cervical disease in women by up to 71%. We also know that it is particularly benefitting women from the most deprived communities, which means that this is contributing to narrowing the health equality gap. The vaccine also protects against genital warts, which are mainly caused by HPV types 6 and 11. We know from the latest PHE data that between 2009 and 2017, diagnoses of genital warts have declined by 90% in 15-17 year old girls and 70% in 15-17 year old boys. This suggests that boys are also benefitting indirectly from herd protection – if less girls have the HPV virus, they are less likely to pass it on to boys. Cervical cancer is the most common cancer in women under 35 in the UK and currently kills around 850 women a year who have not had the opportunity to benefit from the HPV vaccine programme. Not only that, but it contributes to a significant amount of ill health and suffering for patients and their families. These latest findings are an important reminder of the value that vaccine programmes can bring and why we need to continue doing all we can to keep vaccine uptake high. All girls can get the HPV vaccine for free from the NHS from the age of 12 up to their 18th birthday. The vaccination programme is delivered through schools, but if girls miss out they can get it at their GP surgery. The earlier a girl gets it the better, as effectiveness can wane the older a girl is and they start becoming exposed to HPV through sexual activity. How does cervical screening fit into this? 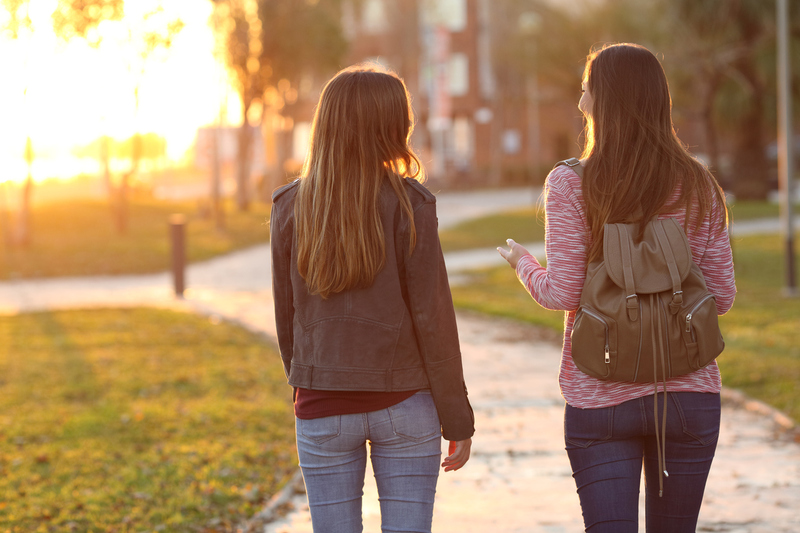 The HPV vaccine is the best way to protect girls from getting cervical disease in the first place, but all women invited for cervical screening should attend their appointment, even if they have been vaccinated. Although the vaccine protects against the majority of cancer causing HPV infections it does not eliminate all infection. Cervical screening prevents at least 2000 cervical cancer deaths each year in the UK by picking up signs of pre-cancerous cells before they turn into something more sinister. Together, cervical screening and the HPV vaccination programme brings real hope that we can significantly reduce the number of women being diagnosed with and dying from this devastating illness. On the 70th anniversary of the NHS, we see this as a reason to celebrate.